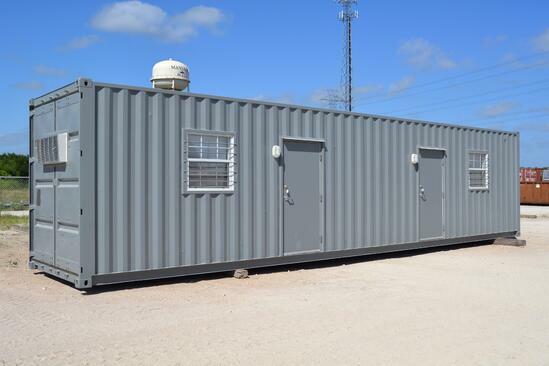 Our shipping container workforce housing is practical and rugged, but may not be suited for a long term home. Placing a shipping container on a chassis — a platform with wheels and a towing hitch — is possible, but containers are not ideal for this mode of transport due to their weight and non-aerodynamic shape. A single 20-foot one-trip shipping container weighs over 5,000 lb. Finishes, furniture, and personal possessions can bump the total weight up to 8,000 lb. Compare a 20-foot shipping container to a fully furnished and loaded 18.75-foot Coleman Expedition travel trailer which only weighs 4,146 lb. A Ford F-350 could probably tow a tiny modified shipping container home, but its motor would be working very hard, especially since the boxy shape of shipping containers creates substantial air resistance. A chassis also requires regular maintenance to ensure the frame, tires and axle are ready to carry a heavy load. Shipping containers are an excellent choice for industrial organizations that need workforce housing on job sites, but consider the resources at their disposal. These businesses often already have lifting equipment onsite and established relationships with truckers. Relocating a container by truck is effective for large businesses because they are able to leverage built-in shipping container features such as crane-ready corner-castings and forklift pockets. Yet, private individuals who opt to move their containers by truck may feel less mobile than they had hoped when coordinating crane and trucking services for repeated moves. We encourage tiny home seekers to compare their options before investing in a modified shipping container. Corten steel is a huge plus for companies that plan to truck their containers through undeveloped areas, but the durability is likely overkill for a tiny home that stays on a mobile home park or private land. A traditional travel trailer’s light weight and more aerodynamic design will likely better suit private individuals who make frequent moves between developed locations. If a customer is committed to the shipping container aesthetic for a more permanent home, we recommend consulting a company that specializes in shipping container homes. Falcon’s focus on industrial shipping container products means that we don’t manufacture shipping container pools. Nearly 15 years of experience tells us that the modifications would be drastic and costly. Shipping container manufacturers construct the containers to be water tight on overseas voyages, but there is a big difference between being water tight against adverse weather conditions and holding over 39 tons of water. When filled, an unmodified shipping container will leak. Companies that convert shipping containers into pools must cover the container with either an epoxy or a fiber glass liner. The weight of the water also means the container must to be intensely reinforced. A quality retrofit on a 20-foot shipping container costs around $27,000, well over ten times the national average cost to install a typical above-ground pool. The price tag may be worth it for the container enthusiast, but we suspect shipping container pools are cost prohibitive for most. Certain people take the mantra “always be prepared” to the next level by excavating under-ground emergency shelters near their homes. These projects come with many building challenges. Underground structures buried only three feet below the surface must be able to hold hundreds of pounds of dirt per square foot. When initially buried, shipping containers may hold up – but the leaking and the buckling will soon begin. Most of a shipping container’s strength comes from its frame. A container can hold over 700,000 lb. equally distributed over its corner castings, but buried containers must resist force pressing against their walls. Soon enough, the ceiling and walls will begin to bow, and the moisture in the soil will seep into the shelter. Like modified shipping container pools, it is feasible to reinforce and seal a container for subterranean use, but the costs will grow substantially. Falcon doesn’t recommend these modifications as safety is our top priority. Shipping container structures are a superior option when businesses need rugged mobile offices, workforce housing, storage, and equipment enclosures, but not all uses will take advantage of a shipping container’s best features. Ultimately, we encourage consumers to do extensive research to confirm that a modified shipping container will best serve their needs. They are highly versatile building components, but no purpose fits in every box. If you have questions about whether a shipping container is right for your project, reach out. We’re happy to help. Call us at 877-704-0177, or send us an email.